ECORP Volunteers at Rocklin's Community Service Day. The city of Rocklin got a bit more beautiful over the weekend with the help of volunteers taking part in the fourth annual Rocklin Community Service Day. Paths were built. 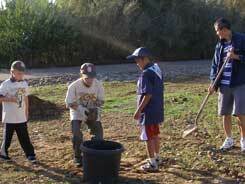 Trees were planted and acorns were gathered by residents. And with the hard work and dedication of a few, signs were placed urging visitors not to trespass on nature preserve areas. On Saturday morning, members of the Rocklin-Loomis Basin Rotary Club with the help of Boy Scouts from Rockln�s Pack 102 worked together to create a cement and stone pathway at the Rotary Discovery Garden in Lone Tree Park. Overseeing the cement pouring was John Nitta, while Eric Johanson guided Boy Scouts Jack Keller and Nathan Barber in placing paving stones to create a smooth walkway. Across town at Johnson-Springview Park, acorns from blue and valley oak trees were collected by volunteers like Jody and Jeff Chesen of Rocklin. �We wanted to come out and do something fun and for our community� said Jody Chesen. The acorns will be preserved until the spring when they will be sprouted into oak tree seedlings and replanted. 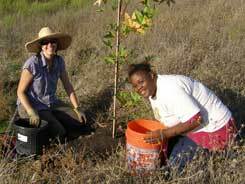 At Sunset West Open Space Preserve, oak trees were planted in a restoration project organized by the city of Rocklin with the assistance of volunteers like Tara Collins, Shawn Colvin and Lydia Sizelove. Several oak trees were planted in the open space to regenerate a natural shade structure. Along with the tree planting, �no trespassing� signs were placed along the nature preserve thanks to the efforts of Jaime Camarillo, who asked the city to post the signs in an effort to keep visitors and dogs out of the preserve. �We often see wildlife in the preserve, like coyotes, hawks, and deer� said Camarillo. �I wanted people to be aware of what destruction dogs can do to a habitat by letting them run loose. There is far less wildlife now than when I first moved here.� Placing signs in various spots along the trail will remind walkers and runners that it is a wildlife preserve area, Camarillo noted. Volunteers were treated to a barbecue lunch at Johnson-Springview Park at the end of their morning�s work.